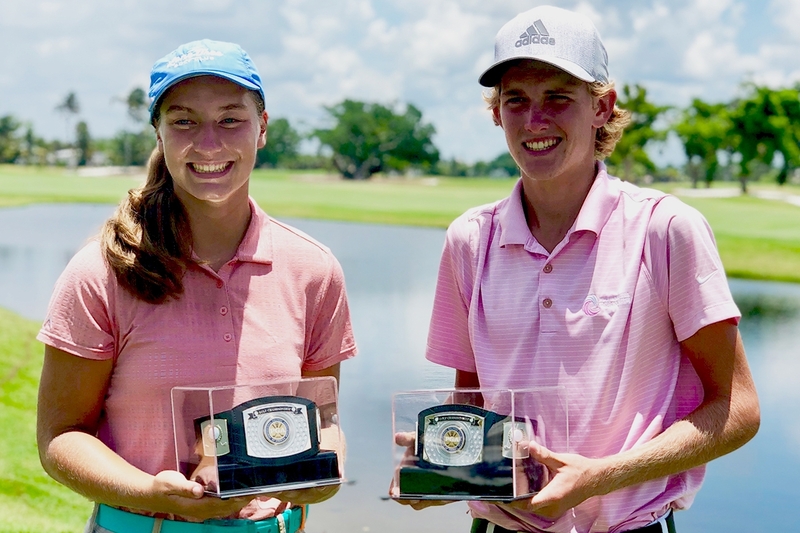 July 13th 2018 - ATLANTIS, Fla. – This week, the South Florida PGA Junior Tour held the 2018 South Florida Junior Open at The Naples Beach Hotel & Golf Club. This 54-hole Junior Major featured South Florida’s top junior golfers. Garrett Giles of Stuart, FL captured the overall boys title after an impressive three days. Giles fired rounds of 71-69-71 to finish the event at 2-under par and capture the title by seven strokes. This is Giles first Junior Major title. Fernando Castillo of Wellington, FL took home the boys 13-15 age division after rounds of 67-75-76. Chad Tracy of Naples, FL took home the boys 16-18 age division after rounds of 72-71-76. Arielle Keating of Stuart, FL took home the girls overall title after a come from behind victory. Keating fired rounds of 79-72-74. Keating entered the final round 3 strokes off the lead but was able to put together a strong final round to take the title. This is Keating’s first Junior Major. Skylee Shin of Doral, FL took home the girls 13-15 age division, finishing with a tournament total of 230. Alena Lindh of Davie, FL took home the girls 16-18 age division after finishing with a tournament total of 226. Brayden Jenard of Wellington, FL took home the boys 11-12 age division after finishing the tournament with a total of 252. Michael Feldman of Delray Beach, FL finished in second place with a tournament total of 268.